When I get a save-the-date envelope, I’m really excited if I see a wedding website URL there. As a wedding guest, I want to see couple’s photos, to read some sweet anecdotes, find out more about their wedding (and honeymoon) plans etc. Although some people still don’t get into wedding websites, I think it’s the best way to tell all there’s to know about your important event. 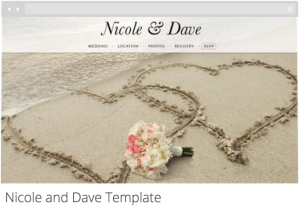 Try Bookmark Website Builder, choose the appropriate template and read our tips on making your wedding website; it’s both useful and fun! It’s not a wedding invitation, give them details! Of course you’ll send wedding invitation with “who, when and where” explanations, but on your wedding website, you can answer some frequently asked questions. For example, how to get to the venue, whether your wedding has a theme or a dress code, is it alright to bring a date/kids etc. If you’re one of those “only I can wear white” brides, let your guests know about the color(s) to avoid wearing. If you’re planning a small and intimate wedding reception, most guests will probably know what you are all about, but for a medium-sized or big weddings, it’s recommended to tell your story. Here, I don’t mean really going into details and writing a 3 page story, but sharing lovely anecdotes and fun facts, how you met each other, things you have in common and, why not, your future plans. Your extended family, guests’ dates and coworkers will welcome it! Most people consider couples shouldn’t send their registry information with the wedding invitation, because it might appear too rude. When it comes to the wedding websites, however, it’s even recommended to include your registry information there, especially if you’re using an online registry for your guests to browse and shop. RSVP online or not, that is the question! Most wedding websites have an RSVP tool, so you can take advantage of it. Online RSVP is something younger folks will appreciate very much, but I’m not convinced my grandma would be crazy about it. So, make sure all your guests have an opportunity to mail in a card with their response, while allowing them to RSVP online, too.